I believe I mentioned a few days ago an accident that occurred with a GPS device and an oncoming train. Just to let you know, I was able to use a GPS device to get me from where I was to CES 2008 in Las Vegas without any trouble. 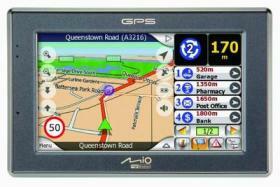 While I CES, I found a GPS that was absolutely awesome: the Mio C720t. At first it seems like the C720t was just your average, run-of-the-mill GPS with a 4.3 inch TFT, landscape orientation, and text to speech. Blah, blah, blah, don’t all GPS devices have those? However, the Mio C720t has some pretty amazing features. For example, the 2 Megapixel Digital Camera. I don’t know if there are many GPS devices with cameras, but I would have to say that this camera is unique. This one allows you to Geotag photographs, which will include the longitude and latitude coordinates. The C720t also has some really fresh multimedia action, and is completely Bluetooth compatible. The C720t package also comes with real time traffic alerts, as well as 3 months of free service. I believe that the Mio C720t was just released, and is the pride of the Mio collection. I believe the suggested retail price is about $499.